Ecuador has become the latest country to launch its own National Multidimensional Poverty Index. The Index, which has been developed with technical support from OPHI, was presented by the President of Ecuador, Rafael Correa, at an event in Quito on 5 February, 2016. OPHI Director Sabina Alkire, who attended the presentation, congratulated Ecuador on the elaboration of a National MPI and said that the Index will be very helpful in Ecuador’s efforts to tackle poverty and ensure that policy efforts leave no one behind. The Ecuadorian MPI shows that while both income poverty and multidimensional poverty have decreased in Ecuador since 2009, declines in multidimensional poverty have been more pronounced. Income poverty actually increased modestly from 2014 to 2015, while multidimensional poverty continued its decreasing trend. The MPI, which reflects a new conceptual framework based on ‘Buen Vivir’ and its associated rights, identifies a higher proportion of people as poor. 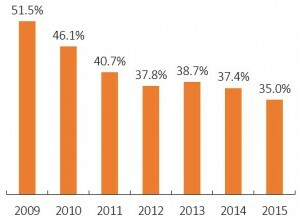 Whereas around 23% of people were income poor in 2015, fully 35% were living in multidimensional poverty. Thus the MPI makes visible deficiencies in key rights, and in doing so supports the affected persons in claiming their rights. The Ecuadorian MPI consists of 12 indicators across 4 broad dimensions (education, work and social security, health, water and sanitation, and housing and a healthy environment). It is calculated at the household level. 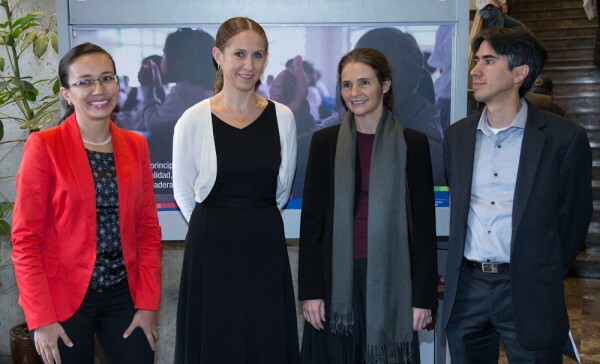 Left to right: Sandra Naranjo, Minister for Planning and Development; Cecilia Vaca Jones, Minister of Social Development; Sabina Alkire, OPHI Director, and Jose Rosero, Director, National Institute of Statistics. All about the Ecuador MPI (in Spanish) from the website of the Ecuador National Institute of Statistics (INEC).